I think I've made it pretty clear that I don't like Discovery, but the idea that it having non-white women is the problem is just nonsensical. Trek has ALWAYS gone out of its way to have a diverse cast, this is just more of the same. The fact that their main character is a black woman is irrelevant. The fact that she acts so woodenly that it feels like there's an extra chair on the set, or that her character inspires loathing, or that the writers are so damn determined to shover her down our throats as the best character ever... these are problems. 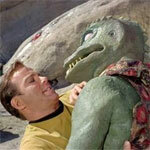 but against the idiotic ideas (spore drive), canon violations, and character assassination (Spock). And neither of the two other ideas (Picard and Section 31) is going to go anywhere. There are actually rumours floating around that none of the proposed/announced series is going to happen, and that those announcements were just intended to drum up interest in Discovery. It's only rumour, but for instance it's being claimed that the only money spent on developing the Picard series was taken from the Short Trek budgets - there is no budget for the Picard show. And if it does happen, it's now being spoken of as a "limited series", not a proper series. The same source claims the Georgiou series is vapourware, and even the animated series may not happen. Maybe the rumours are false, but it wouldn't surprise me to see modern "Trek" tumble like a house of cards once season 2 of Discovery is out of the way. Yes, a black female lead is highly irrelevent. The difference between Sonequa and Nichelle Nichols, though, is acting and talent (Ms. Nichols can SING) not to mention that Nichelle is hot as hell (even at her age). While not given much of a chance on TOS, Nichelle also appeared in ST-OGAM (along with other ST alums from across the franchise) and was really good. My information comes from a youtuber who says he has a reliable source inside c[the]bs who has been very accurate, so I cannot and will not vouch for the veracity of said contact. But he does intimate that none of the proposed series is a go and that Kurtzman is just about out the door and that c[the]bs/bad reboot will lose their license for ST meaning it will revert back to Paramount (especially if the proposed Viacom/CBS merger goes through). I'm sorry to say that one of the most beloved SF franchises is in such a state of uttter confusion, disarray and incompetence that even long time fans are wishing it to finally end. Startrekanmore wrote: My information comes from a youtuber who says he has a reliable source inside c[the]bs who has been very accurate, so I cannot and will not vouch for the veracity of said contact. Yeah, this is the same guy I've posted here a few times - Doomcock. He claims to have an inside source in the company. Maybe so - leaking stuff to the press is a common tactic in corporate media politics. I would hesitate before considering Doomcock and Midnight's Edge as having reliable sources. Doomcock is amusing but the character is silly, and ME speaks with equal unsourced authoritativeness when right or wrong. This is not to suggest anything nefarious . . . both can have very good insights, at times . . . but I listen with grains of salt handy. DSG2k wrote: I would hesitate before considering Doomcock and Midnight's Edge as having reliable sources. Doomcock is amusing but the character is silly, and ME speaks with equal unsourced authoritativeness when right or wrong. Both of them consistently state that they are reporting unconfirmed information and that it must be treated with caution. I'm not sure what more they could do. True enough. But, to my mind, there's a difference when a non-partisan says that versus a partisan, and how much stock to put in it. If such rumors are picked up also by other entertainment sites, it's a different ballgame. Basically, the danger I seek to avoid is that of the echo chamber that is too easy to slip into with partisan news. I'd love to hear that CBS has decided to course-correct and is driving to the homes of Behr, Moore, Coto, the Reeves-Stevenses, et cetera with truckloads of cash and an apology along with a request to reboot the show back to proper Trek. However, I also recognize that's unlikely and wouldn't trust it if I heard it from a partisan site only. That's all I'm saying. DSG2k wrote: True enough. But, to my mind, there's a difference when a non-partisan says that versus a partisan, and how much stock to put in it. If such rumors are picked up also by other entertainment sites, it's a different ballgame. Basically, the danger I seek to avoid is that of the echo chamber that is too easy to slip into with partisan news. But again, they're not reporting it as confirmed news. They're reporting rumour, and labelling it as such. And their partisan bias could hardly be more clearly stated. Essentially what we get on the likes of Doomcock videos is "Discovery is terrible, and my inside source is saying it's about to be cancelled. But that's just a rumour and you should not consider it as confirmed fact." Sure it's partisan but unlike, say, Fox News, it's not pretending to be unbiased. And it's completely upfront about what's opinion, what's fact, and what's rumour. If partisan content and/or discussing rumours is not to your taste that's perfectly fine, but I don't see that it's problematic beyond that. I'd love to hear that CBS has decided to course-correct and is driving to the homes of Behr, Moore, Coto, the Reeves-Stevenses, et cetera with truckloads of cash and an apology along with a request to reboot the show back to proper Trek. Depends on what you mean by "trust it". If it were reported as a rumour I'd certainly trust it as a rumour. I'd keep it in mind as events played out, having reactions of "oh, look, the rumour seems to be confirmed" or "oh, look, the rumour turned out not to be true" as appropriate. I wouldn't just take it as a fact from the outset, because the report itself clearly states that it's not a confirmed fact. Rebooting as proper Trek? Why not approach Mr. Tribble himself, David Gerrold, then? They may hit the reset button, but this hypothesis as explained requires continuity knowledge they don't seem to have and pro-continuity creative storytelling they don't seem to be capable of. Also, pardoning the late reply, but I'm supposed to ask "Mr. Tribble" what, exactly? DSG2k wrote: They may hit the reset button, but this hypothesis as explained requires continuity knowledge they don't seem to have and pro-continuity creative storytelling they don't seem to be capable of. He means asking David Gerrold to take Discovery back to the actual "spirit" Trek. Do I have the gist of it Nutso? That was actually Startrekanmore's response from last month.